Much of it not swept or not very well still. Almost all of the 'go around' plastic signs have broken bases and island concrete is not holding up well, other than that it looks very nice. Your photos paint a prettier picture IMO than what I saw Sunday, Ian. A little rough around the edges, but holding up well. The plastic median bollard was a bad idea. I'm not a big fan of how any of it turned out, and as I expected, it's aging fast and poorly. Overall it looks great and is a nice place to walk/sit, but clearly winter and snow removal impacts its lifespan. Better than before, but it's still not really a nice place to sit thanks to poor or non-existent buildings and it's not really a nice place to walk thanks to about a million posts, meters, bollards and whatever crowding the theoretically wider sidewalk, along with cars parked past the gutter because the design allows drivers to think they're supposed to park right up to the meters way up on the "sidewalk"
Should be permanently closed to vehicle traffic south of Jasper to 99 ave. no need for traffic gravel, clear snow with sidewalk snow blowers and sweepers. I don't know if complete closure would work, there are a couple alley and parkade accesses that would have to be considered, but one-lane one-way with a 30km/hr limit and just a few loading spots would be fine there. They certainly could have done it a lot better, and given a lot more space to people on the sidewalk rather than cars on the street. The problem isn't with the streetscaping, that's all just pig lipstick. The problem is what is what is lining the street. There's very little there to draw pedestrian activity. South of Jasper Ave it is dominated by concrete bunker-like government office buildings, most of which have next to no street interaction at all. I count one coffee shop in the IBM building and a Good Earth across from Petroleum Plaza, but they're only open during worker bee hours. I suppose its too much to hope that these buildings will be refurbished. BLVD with its patio is a nice addition, and the Mayfair North should add some life when its done. Between Jasper Ave and 103 Ave it's mostly dusty parking lots and ugly 1-2 story commercial buildings, plus a Rexall that's closed off from 108 St, a Money Mart, a funeral home and a drab Norquest fortress. The interesting El Mirador apartment building is the only saving grace along here though it could use some TLC. Norquest expansion should help, I hope. This is a stretch ripe for redevelopment. North of 103 Ave is actually OK with the Parlour, Dennys, a daycare, the Western Supplies building and the MacEwan bell towers serving as a bookend. But those parking lots need to be redeveloped. Last edited by Sonic Death Monkey; 12-05-2015 at 05:10 PM. Can't argue with Sonic DM. especially when there are some really great potential retail spaces south of 100ave - large concrete plazas facing east and west. hopefully that develops away from tinted window dentist offices etc. just get rid of all the concrete finishing features. maybe some wood or steel would be a nice change? And i'd take Highlander's suggestion too. The new Norquest will help it a bit, but yes there needs to be plenty of other changes to the buildings and businesses along that whole stretch to make it a much more pleasant walk. Something other than office space would be nice. No reason for anybody to walk down the street unless you work in one of the engineering or architecture firms, etc. The good news is that a major developer owns a pretty large chunk of the East side of 108 street, North of Jasper Ave. But anything happening there is likely a few years away, yet. From what little I know, that development would almost single-handedly transform that stretch of 108th. ^I've always thought this area has a ton of potential, since when I used to live around there. As long as he leaves El Mirador alone. It needs some TLC but it's a neat looking building. Yeah, for better or worse it's not long for this world. Recognizing its significance to the citys built heritage, El Mirador is on the A list of the Register of Historic Resources in Edmonton. Any plan to dramatically change or demolish the structure must first be brought to a vote of Edmonton City Council. With enough creativity El Mirador could be renovated/renewed and then the surrounding area could be developed to create a great set of mixed use buildings that could bring the whole area to life. Top_Dawg is quite certain that many of the problems that plague the Buena Vista are also present at the Mirador. Maybe not so much the Patricia Annex, but the main villa style building. All the while - it is unique - that's for sure. What the truck brings brunch to Capital BLVD, June 14. What the Truck?! hosts a brunch-themed gathering on Sunday, June 14 from 11 a.m. to 3 p.m. at Capital Boulevard at 108th Street and 99th Avenue. Organizers promise 15 food trucks, each serving up at least one brunch item. Watch for a green eggs and ham taco from Orbit, a banana bread french toast from Phat Tony’s, plus ice cream sandwiches from Cookie Love that will combine Irvings Farm bacon and Captain Crunch cereal. Check out the full list of trucks at whatthetruck.ca. I would really love to see the half-block between 100 Ave and IBM (currently a Christian Science building, a parking lot, and former United Way office) demolished and a swanky new highrise hotel/residential tower built there with a solid restaurant & bar presence. 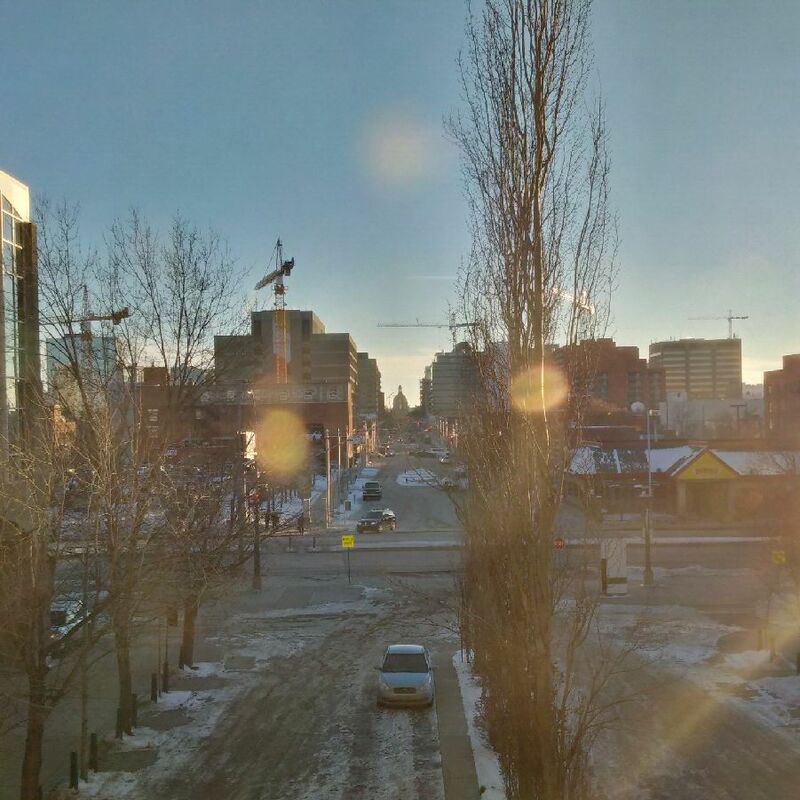 A redevelopment north of the Rexall store is sorely needed too. It needs more than just a couple of little design and copy studios. 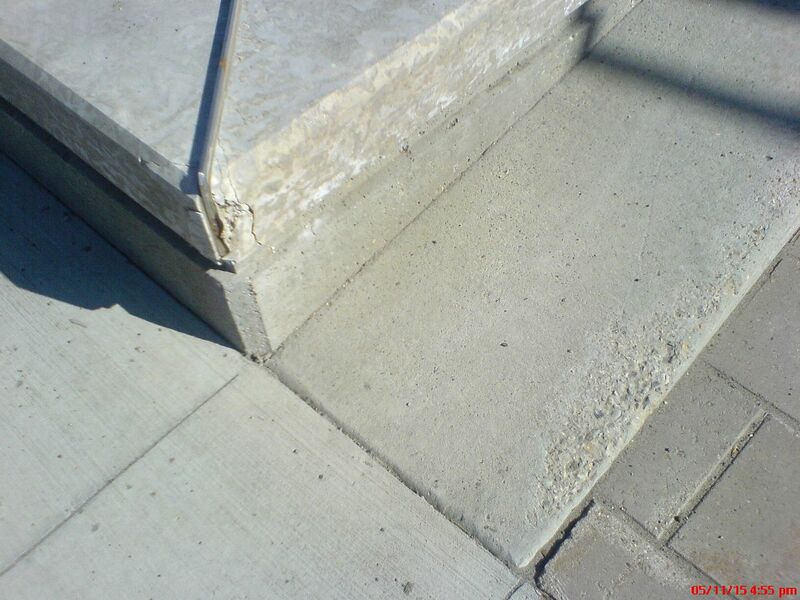 Even before the focus of making Edmonton a "Winter City", concrete needs special consideration in an environment like Alberta. I find it questionable that the durability and lifespan of the materials involved were not put to higher scrutiny. I'd be interested to know more about the cost considerations, and what the estimated lifespan of the current product is. Is it just me, or is todays' concrete of a lower grade and quality? Many older projects in the city seem to be made of a material that has weathered better over the years, versus new construction which seems to get cracked and chipped within the first snow season much more easily. Were less environmentally friendly materials used in the past material and perhaps phased out? ^it's not just you. I was commenting the other day how my concrete patio, driveway etc have only a couple minor cracks in them. They've been there for 35 years. New concrete work around METRO LRT line that has had no use, is cracked everywhere and looks like a 50 year old driveway. I wonder if our previous City Managers "hands off" approach has anything to do with the quality of concrete agreed upon in particular contracts. 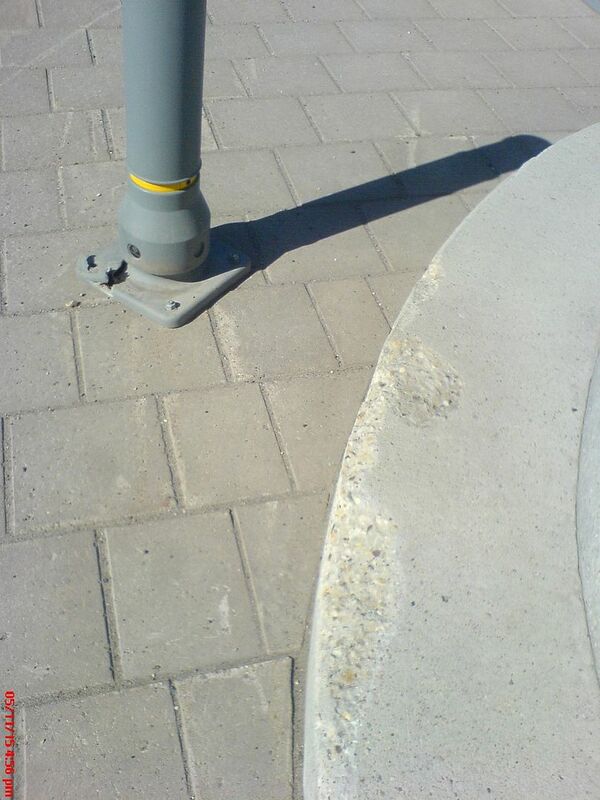 Those granite bollards are looking pretty rough, half of then leaning to the side, a couple knocked over completely. Great vista, just need to fill in the flanks. Plenty of construction cranes in town! Granite? Or are you talking about those tall Tyndall stone clad column things? Sorry, do you mean these granite bollards? Or have they been changed following this story a couple years back? They showed the bollards on 104 St - vehicles do hit them but it's usually the vehicle that's damaged. Last edited by KC; 19-01-2016 at 10:33 AM. Does any one know if they'll put the 4 way stop back in at 99ave & 108 St after the Leg grounds are done? Over the weekend they put in a 3 way stop! Better for traffic and pedestrians as some people fly down 99 ave! It is better as a three way, most things are. 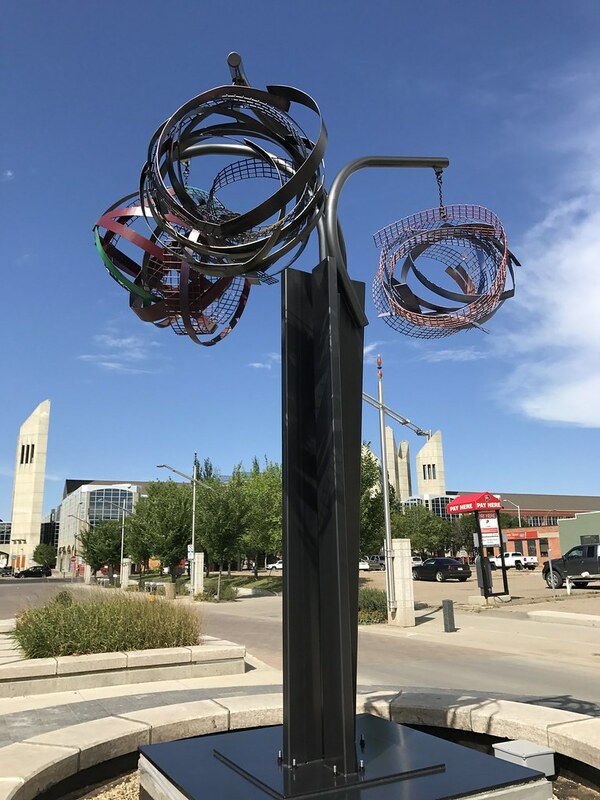 The City of Edmonton could soon be poring over endless Pinterest pages looking for inspiration after being the latest to join the upcycling fad. 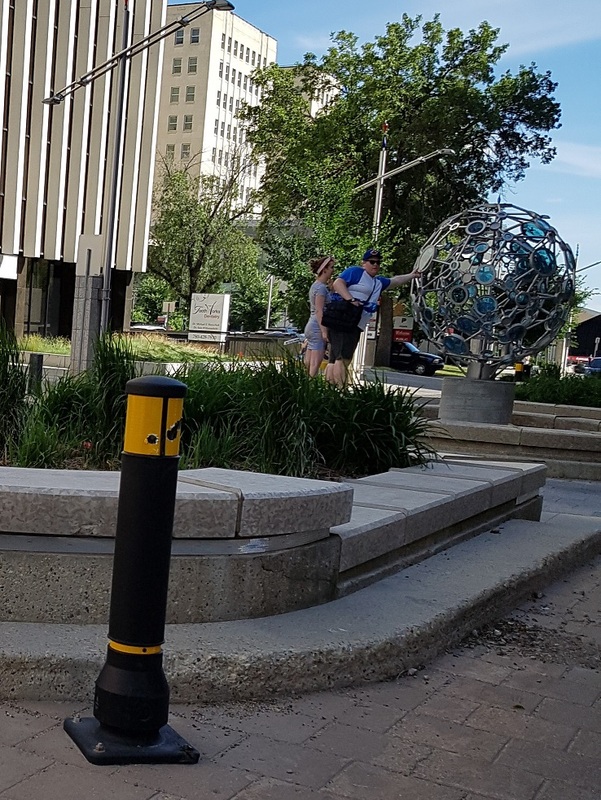 Metre-high granite columns, intended to “extend the formal character established by the legislature building and forecourt into the downtown” as part of the $15 million Capital Boulevard on 108 Street project, have been mothballed. But far from being ditched, the city is looking for new ways to use the pillars which each cost $1,000. But city drivers and snow-clearing equipment operators, failed to come to terms with the project and breakages started almost immediately after they were installed. 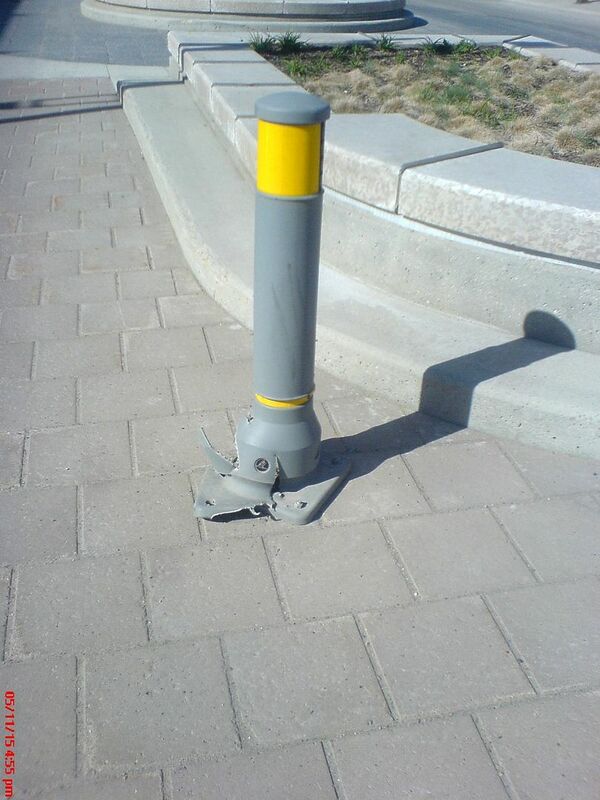 In 2013, the city stood by its decision to install the bollards, but further damage forced it to rethink the design and in July 2014 their removal began. Almost none of the bollards are left, with a handful scattered between 99 Avenue and 104 Avenue. Maybe they should have used the same bollards that are on the 4th St promenade instead of those flimsy things. The two-metre sphere is made of hand-crafted blue glass tiles, tiles that catch the light. Get up close, and you’ll see the glass panels feature historic images of Edmonton and Alberta taken from the heritage photographs of the Provincial Archives. It’s the work of southern Alberta glass artists Julia Reimer and Tyler Rock. I'm looking forward to them, too. I like all of them. Love this so much. But it's too bad the call for submissions couldn't have gone out earlier as the timeline to have the art complete is tight. I foresee delays, as is common in Edmonton these days. How much did the taxpayer pay to have rolled scrap metal hanging from a chain? I could have made this statue in a day, it better not have cost more than $400, and that is being generous. I am all for public art but this is not impressive. 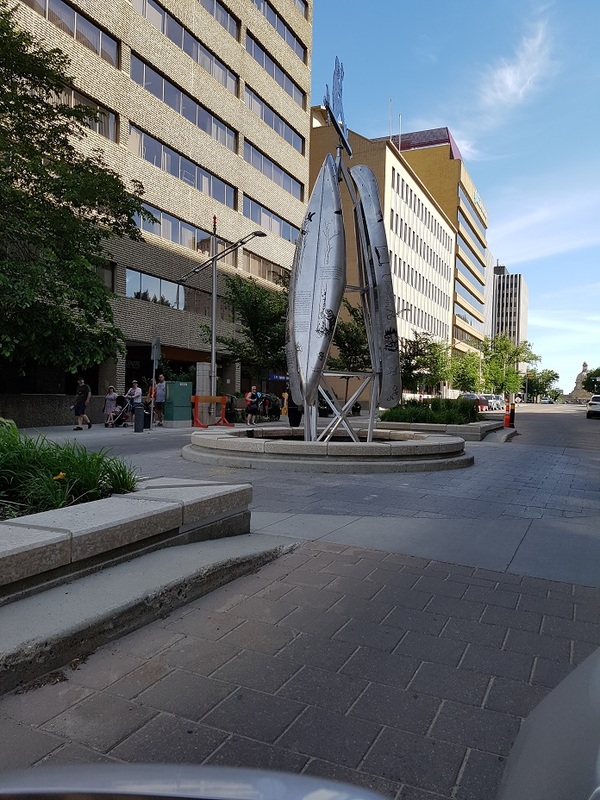 I looks at some of the other public art installs in canada and this just doesn't stand up. This last one isn't my fav but oh well. I like the first two. The last one is so bush league, I expect artists to have more skill than that, this artist is just a poser. Sweet! Some garbage balls to balance out the shiny balls on the Whitemud. What kind of balls we gonna get next? What ever happened to statues, or art representing the City? Dang, now I'll have to go see for myself! This is the 3rd out of 4 pieces of art to be installed. The first two have more historic, Edmonton specific themes. This one is much more abstract. 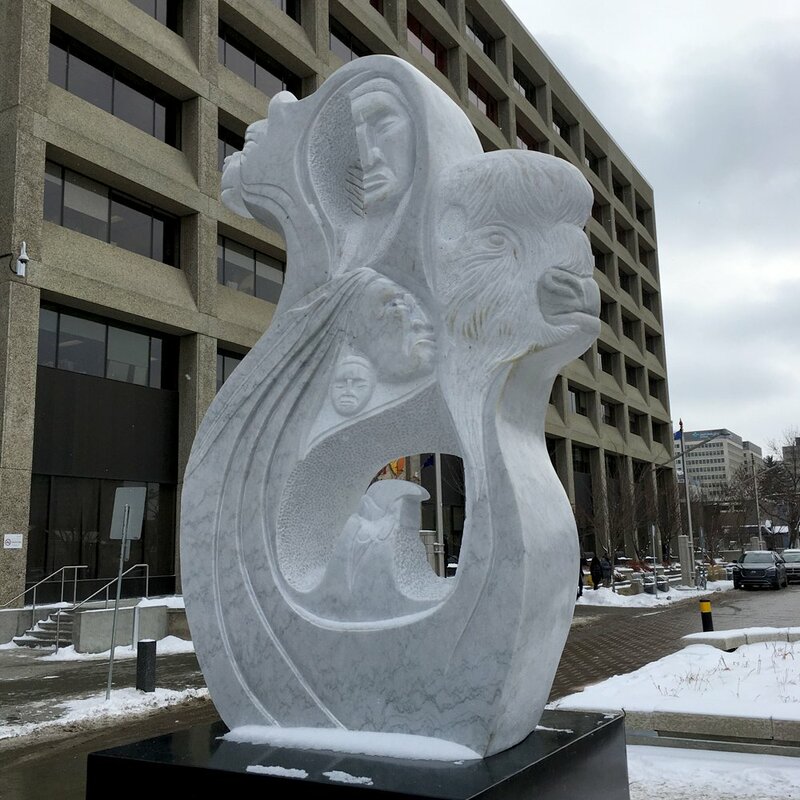 This Saturday at 130pm outside of NorQuest College will be the unveiling of the final piece (5 total) of art. I was trying to photograph the legislature but this kept getting in my way. What a great ceremony and stunning final piece. Love the public art pieces but the stone chosen for the last one leaves me underwhelmed. The colour or lack thereof prevent it from standing out. Maybe it’s just the drab Norquest bldg behind it in the picture, as I haven’t seen it in person yet. Go see it in person, it is beautiful. I've now passed by these art pieces a few times and I really like how they add so much visually to the street. You can see the potential on 108th now, but still a long way to go in terms of development of some of the parking lots and run down buildings. Lots of gaps. Indeed. The public realm is done, now time for some public investment such as Mayfair. from my perspective, what these were designed for is/was a failure either in the assumption or the execution or both. on the east and west sides you cannot enjoy them without standing in the middle of a lane of traffic. on the north and south sides, you are directly in the line of approaching traffic and, after dark, their headlights. it's the middle of the f'ing street even if it's midblock and nothing about it is conducive to contemplative enjoyment, particularly during the winter. what's interesting is that this was a conscious choice that many were not in favour of as the sculptures and the podiums further restrict what was already a restricted view of the legislature's dome. this criticism has got nothing to do with the sculpture pieces themselves - they're varied and interesting and deserving of more than their setting gives them. i'm equally as unhappy with some of the execution as with the design intent of the setting. the curb and capstone alignments were asking for punishment the day they were detailed and the forced addition of those rubberized freestanding yellow and black striped "danger/warning" signs reinforce it all as a place to exercise caution and avoid, not contemplation. and yes, they're mid-block crossings but they're also pretty dangerous mid-block crossings in that the pedestrians using them on the far side of the direction you're travelling in aren't within eyesight. if you watched them step out from the sidewalk, you'll know to watch/wait for them to enter your lane as they walk across but if they have been contemplating the art as you say they will and then step in to your lane when done, you're talking about accidents waiting to happen. if we wanted an actual sculpture garden as part of capital boulevard - and i don't think we have enough of them so it certainly wouldn't have been a bad idea - we could perhaps have used some of those surface parking lots and made it a destination or we could have done it on either side of the street or a mix of both sides without having to convolute traffic flows and snow removal while making the sculptures less accessible. 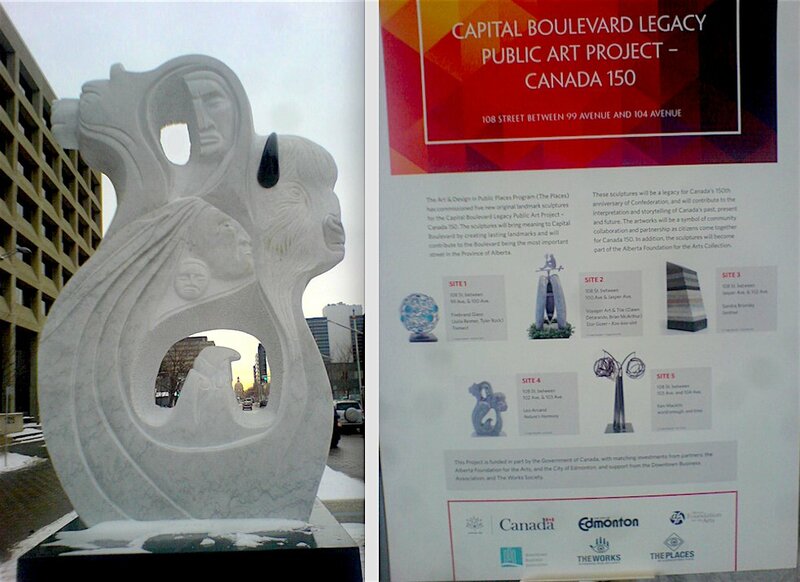 we could have done a proper sculpture garden as part of capital boulevard and then added another in kinistinaw park and maybe another in louise mckinney park to complement the indigenous art park going on the queen elizabeth pool site and the sculpture park that is developing in borden park. we could have added one around coronation pool or beside beaumaris lake or in rundle park. we could have, one step at a time, created a series of destinations that would be pretty spectacular. at best, what we did here, if not an outright failure, is still edmonton's fall back "good enough, it's better than nothing". it is good enough and it is better than nothing but it's not what it could have been or should have been. I agree with you. I think their is a naive view on the part of some if the Government spends a lot of money somehow it will ensure quality, whereas in fact it only changes the scenery and not necessarily for the better. The art is in the execution of it and I don't know what is missing in the city administration right now, some might say common sense. Good enough, is NOT good. In any event poorly executed things only make people less willing to support such initiatives in the future, so the people who advocate for and are involved in these things should keep this in mind. If they get it right, there will be more public support for more, if they botch it up, less support. Great pieces, stupid locations. Why are we putting art on the sides of freeways and in the middle of roads? I thought we were attempting to be more pedestrian, but we put public art in places where you really only get to experience it as you drive by, almost begging the driver to be distracted. I wish the new tower came with critical thinking lessons for those working inside it. What's bitter about wanting great art (which we have) in a great location? It's not difficult. It's almost as if planners go out of their way to make ridiculous decisions. I am not sure people understand the process here. What does that have to do with the placement of the, which was the main critique? Am I missing something, but cause that seems entirely about the selection of the piece and not the placement. to quote one of someone’s favourite posts... “bingo”. this is a project design and execution criticism, not a criticism of the art. even under the percent for art program, it has been an outstanding criticism that both the art location and often even the type of art has been predetermined before the call for artists’ submissions is even made. this wasn’t five artists wanting to place sculpture in the middle of the street, this was a commission to five artists for art to be placed in the middle of the street. a very different process. Last edited by kcantor; 22-11-2017 at 07:10 AM. Everyone coming in at the 11th hour to comment when the design work for this was what, 8-10yrs ago now? Not sure if it's stubborness or another word that starts with "S," but you keep missing the point. We love public art. We love nice things. We hate how the City sites this beautiful public art. I mean, the Talus Dome is incredible, if you turn off Fox Drive at Ft. Edmonton Park to look at it up close. If not - it's a waste of space. Folks eastbound probably don't ever see it at all - let alone a mere passing glance. Tell me all about that beautiful public art at McKernan/ Belgravia LRT station? What's that you say? What art? Exactly. There is public art, we paid for it and I'm guessing a couple of hundred ten year olds on their way to school see it every day. I'd have thought the arts council would have a credible curator among its membership, but apparently not. There are discussions about placement and I don't disagree, but the Talus Dome is appropriately placed, as are many others including Bel/McK, Southgate etc. Anyone who knows anything about art knows the Talus Dome is NOT appropriately sited. In fact, it is the siting that makes the dome the object of derision that it is. And really - public art in a tunnel is appropriate siting? Southgate? Okay, I'll grant you that one. Whimsical piece, nicely sited. 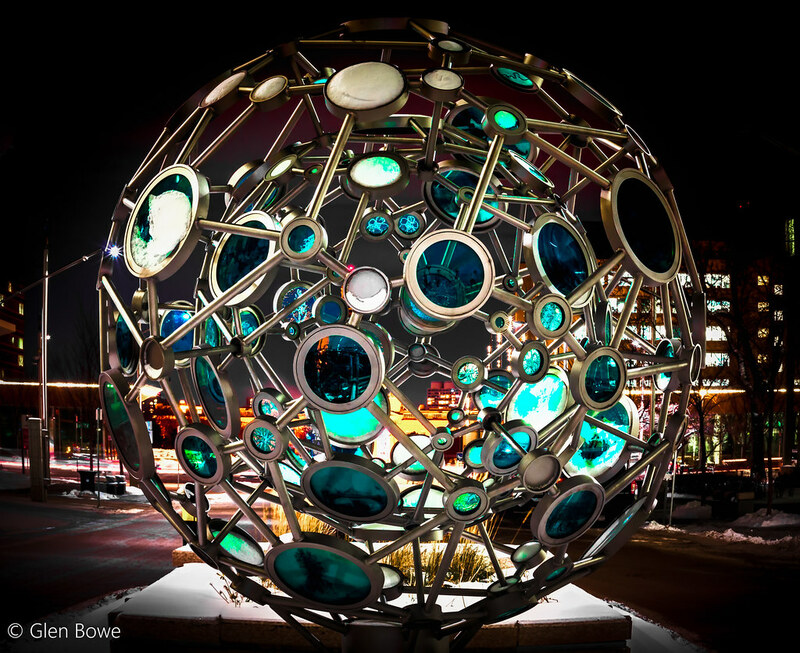 I'd love for the Talus Dome in the middle of Churchill Sq., but given the locational inspiration and all... and when I am driving to the SW it is actually something interesting to look at, albeit briefly. That said, not opposed to the 1% art pieces being permitted to be placed elsewhere. Well, two points of agreement then - siting a great piece of public art stupidly for (legitimate or not) safety reasons is a good argument for allowing the artwork to be sited off-site. I mean, IMHO the idea of (expensive) art is not to have it merely glanced at in passing, yes. Talus Dome was never meant to be in the middle of anything. It was supposed to be at the bottom of one of the curved sections of the retaining wall north of Groat bridge. Like a Talus, aka https://en.wikipedia.org/wiki/Scree. But somehow (the contractor if I remember correctly) it wasn't allowed where it was supposed to be so it was dumped where it is now for hardly anyone to see it. Are my eyes working correctly? Is someone trying to defend the location of Talus Dome? We've hit peak stupid. This. It was supposed to be in the retaining walls/curves. And it would have made good sense there. I specifically remember seeing a rendering of that in a newspaper or maybe on CBC and was confused when it appeared where it did. Last edited by Marcel Petrin; 22-11-2017 at 12:07 PM. How expensive would it be to move it to Louise Mckinney Park? It'd look great heading down from the top of the hill on 98th avenue looking towards downtown. Maybe you could get Alldrit to sponsor it, so it'd be right below their new tower in the valley. Evidently the compromised version we've got was engineered/built specifically for the site that it's at. Moving it would basically be like starting over from scratch. Highly agree. Many of us show up in person and talk face to face with many players and staff on projects the City does. Will, granted, you can be frustrated with the placement, this was a discussion from many moons ago. the overall collection and its curation is actually pretty decent and many aspects of the two are - although far from perfect - considered a decent model by other cities. 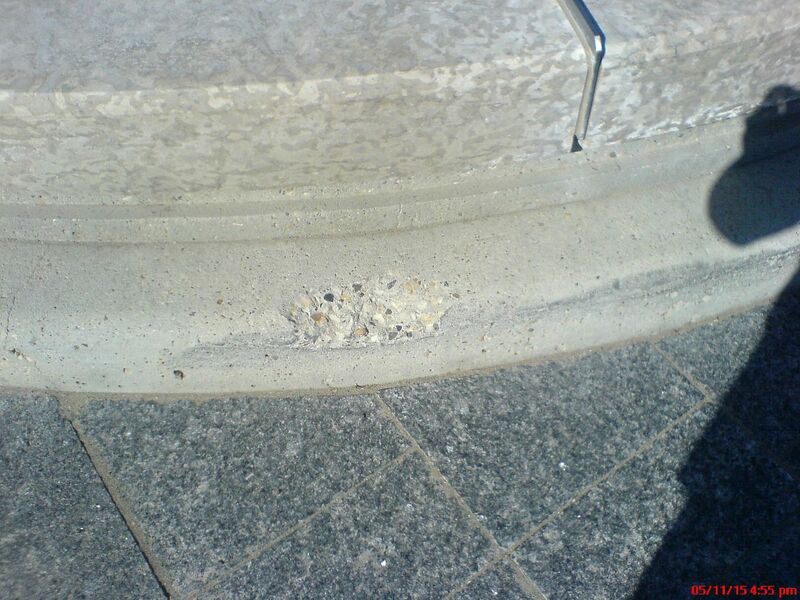 our lack of awareness probably deserves more criticism than our collection of public art. sometimes it means the process itself was flawed as much as the result. Description:	To change the use of an existing mixed Commercial Uses building to an Apartment House (154 Dwellings) with General Retail Stores and construct additions & interior and exterior alterations, and construct an Apartment House (60 Dwellings) with General Retail Stores. Hmmmmm, this could be interesting. Any renders available for this project? ^indeed it is and it will be great to have more residents on Capital BLVD and in that area in particular. i think this building has a pedway connecting to it? Wonder if that comes down? Last edited by norwoodguy; 28-03-2018 at 03:35 PM. I don't believe so no. Description: To change the use of an existing mixed Commercial Uses building to an Apartment House (154 Dwellings) with General Retail Stores and construct additions & interior and exterior alterations, and construct an Apartment House (60 Dwellings) with General Retail Stores. Ah the vacant - or nearly so Centre West Bldg. I was just on the LRT and the leak near Corona station is impressive. The station is closed. I look forward to all the asphalt patching remaining for 5 years before the street is returned to it's previous state.